Sometimes people try to remove animals on their own from their premises. They lay traps like an amateur which later hurts or even kills the animal. Nobody has the right to hurt animals like that, so it is wise to call a wildlife removal company as they have the right strategy, equipment, and training to safely capture them. They regularly check their humane trap and release the animal where it is supposed to live. The entire removal process is safe and nobody is hurt. Like already said, wildlife removal professionals have proper training and expertise. It may take you months, weeks or days to locate the animal but a professional will easily be able to locate it in a few minutes and discharge it out of your house. They remove it with utmost efficiency saving you a lot of time. During the mating season if you by mistake trap the mother of any raccoon or squirrel then it may lead to the death of her offsprings. Their nests are very hard to reach but a professional has all the right idea to reach and take them out safely. They make sure to check the entry points and prevents it in such a manner that there are no similar problems in the future. As we all know animals like mice, raccoon and squirrel are clever creatures. They are always up to some sort of mischief, they will climb down the pipe hole or enter through tiniest of the crevice to live in the house like yours. A professional wildlife company trains its personnel to prevent these creatures to enter your house premises. Hence, hiring them will help you to block them in the future since they have a lasting approach to eradicating wildlife. It is very disturbing when you are trying to sleep at night and you hear strange noises from your attic. These noises come from scuttling feet of mice and squirrels. Raccoons and mice are nothing like they show on TV. If you’ve ever experienced a wild animal infestation, you know how disturbing late-night run-ins ike these can be. Hence, it is wise to call a reputed wildlife removal company who can give you a good-night’s sleep by providing you with their trustworthy services. Animals are wild entities, they carry a lot of germs with them. Critters, like raccoons, bats, and skunks, can carry rabies and other diseases in their saliva and feces. In order to keep your family and yourself safe from all this, call a professional as they have proper cleaning tools which will help to keep such diseases at bay. You wouldn’t get to enjoy such benefits if you don’t hire a professional wildlife company, So don’t waste time. If you have an animal infestation, call them today! To find a reputed wildlife control company, you will have to take the help of your local animal control agency. They will know companies who can do the job professional, while also ensuring safety for both the animals and the crew. Local animal control agencies usually work alongside private wildlife control providers and you can know them well if you try. You should also check the reviews of a few companies providing animal control services on the internet before finalising a particular company. This will help you find out the professionalism of the company and you can make a decision accordingly. You should take good care of credentials of a company providing risky services like wildlife control. Companies that provide wildlife control services should be properly insured and bonded. Check with your shortlisted companies and ask whether or not they are insured and bonded. Also, all their licenses should be up to date. The company should be in compliance with all local and state laws and their technicians are registered and certified. It is advised that should seek out professionals with a good experience. Your chosen wildlife control company should be well established, with at least a few years of experience. Before getting the actual job started, you will be required to call the pest control company to perform an inspection of your property and provide a written estimate based on what they discover. It will be on the basis of this written contract that the job will be performed. Make all your inquiries during this period. Ask them about the specific methods that they plan to use during the process, and make sure that only humane wildlife control measures are used. Make sure that they agree to all your needs. Also, ask them about the cost of the job and about any hidden costs as well. Once you get the wildlife removed from your premises, you also need to make sure that they do not re-enter. Ask your wildlife control company about some tips on ensuring that this doesn’t happen. Ask them about their exclusion services the they will implement to keep your premises free from any wildlife. Squirrels in attic removal & prevention methods are not all good. Squirrels in attic removal methods can not always be trusted from all service providers in Toronto. Squirrels in the attic are the number one Wildlife issue for homeowners. The amount of insulation found in the attic limits the sounds of scampering feet. Squirrels in the attic can be very dangerous for the homeowners if untreated. Squirrels are known to chew up everything which includes electrical wires. The faster you remove Squirrels in roof sections of your home the better. From the minute a Squirrel enters your roof it’s causing damage. Roof vents and plumber mats once chewed allow water into your attic, therefore expect water damage to your ceiling. Once Squirrels in attic colonize, you can also expect them to chew on everything inside the attic. Squirrels severely damage electrical wires which is a main cause for home electrical fires in Ontario. Last of all is all the disgusting bugs living on Squirrels. There has been numerous cases of homes becoming invested with Fleas and Ticks; most times the removal of the Squirrels is not enough for the insect issue to go away. Squirrels need to removed professionally to prevent inner damage to your home. A Squirrel in the roof of homes can cause major damage. Can Squirrels in roof of homes can be prevented? Of course Squirrels chew through almost everything built onto a house. It’s a shame home builders do not consider Squirrels in a roof there issue. Metal roof vents and metal roofline guards are a good defence against Squirrel invasion, however, most homes have plastic roof vents and no roofline guard. To prevent Squirrels in attic situation, it’s best to secure problematic areas of your roof. Galvanized metal appears to be the best defence against a Squirrels in the attic issue. No need to remove plastic roof vents, as a metal guard installed over a roof vent solves this issue. If wood is exposed along the roof edge it will be a issue. Therefore placement of angled sheet metal or screen over exposed wood solves roofline issues. Placement of galvanized metal in such places as corners of dormers should be mandatory from the builders. Remember anything plastic or wood is always easy for a Squirrel to chew through. 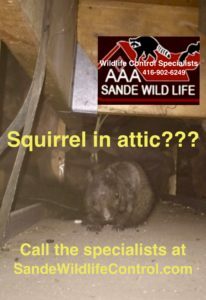 How do you find a good Squirrel in the attic removal service? Therefore, be sure to check out Google, Yelp and HomeStars reviews from the service provider. There are many review sites available for businesses, however, not all of them are up to par. Trust Google and HomeStars always does a checklist against fake reviews companies do themselves. Reviews can not be trusted unless from Google or HomeStars. 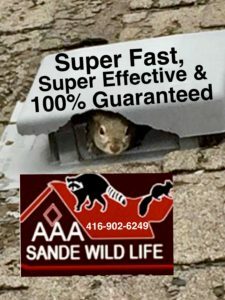 If you wish to check out our reviews just click on HomeStars reviews and search for Sande Wildlife Control. Sande was prompt and thorough. He arrived exactly when he said he would, worked quickly and did an excellent job. Would definitely recommend him! Squirrel removal is definitely one of the animals we deal with in Wildlife removal. Each type of wild animal removal we do has its own ways of getting into homes. Discovery and closure of these weak areas is what we specialize in doing, without breaking your bank account to do so. Affordable wildlife removal is what our services provide to home owners, with guaranteed results. Thanks for sharing a review on our services as it’s greatly appreciated Talia. Raccoon removal is needed for many reasons. 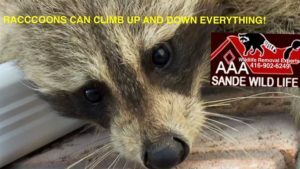 Raccoon removal specialists at AAA Sande Wildlife Control make Raccoon removal look easy. Usually Raccoon removal is needed when it becomes a nuisance on your property. Raccoons being nocturnal animals are responsible for lots of chaos at night. When you hear the word Raccoon, the word trash can usually comes to mind, followed by “this damn Raccoon gotta go”. These little creatures are always scavenging through the trash cans for food at night. By the end of one night, a single Raccoon can create a huge mess for homeowners to clean up. Proper storage of garbage containers can prevent a problem before it begins. A secure storage shed or garage is best to store garbage. While many Raccoons live in tree dens, however, our shortage of mature trees has our homes in the Raccoons view for shelter. One Raccoon, let alone a bunch of Raccoons, will have their effect upon you and your property. Raccoons find shelter under porches or sheds as well as inside your roof. This can easily become a nuisance for any homeowners. Many homeowners have tried to remove Raccoons with failing results. Most homeowners soon realize how much the Raccoons can out think us. While raccoons are considered adorable and cute by some, many classify them as pests and troublesome creatures. That is why many people prefer to hire Raccoon removal services to evict or remove raccoons from their properties. 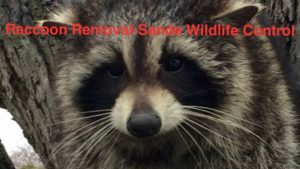 Sande Wildlife Control offers Raccoon removal services in the Greater Toronto Area and are one of the best Raccoon removal services out there. The Raccoon removal service costs somewhere between $295 to $500 Canadian dollars depending on the situation. If the raccoon has a dwelling in the house, a one way needs to be set up, additional holes need to be secured and Raccoon damage needs to be repaired. 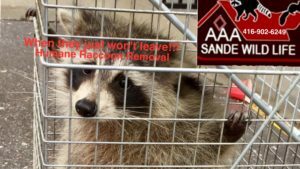 However, if the raccoon just needs to be trapped and taken away, it can cost significantly less but doesn’t prevent other Raccoons from taking over your home again. The best way to avoid needing a Raccoon removal service is not to give them access to food and shelter. If there is no food for them to find or a way for them to get into the house, Raccoons will automatically leave the premises. A Raccoon can tear a hole in the roof, rip up a roof vent or push up metal soffit to get access to the attic. This can result in a lot of ruckus and a lot of mess to the insulation as well as water damage. They will not only be leaving feces, but will also give birth to their young once inside the roof. You need to identify the areas where this damage can occur so you can control it. If all personal strategies fail, you can always hire a Wildlife control service like ours. We will send someone over for fast and effective Raccoon removal. 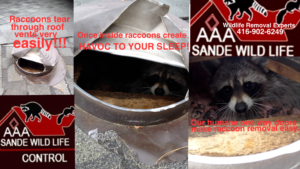 While some services may use lethal ways to get rid of Raccoons, our humane methods at Sande Wildlife Control makes us not one of them. People believe they can take care of a Raccoon infestation themselves, however, usually that’s not the case though. To keep away one or two Raccoons compared to a clan of Raccoons is another story. They cannot be dealt with unless professional help is hired. 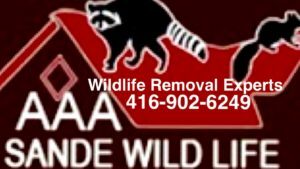 Here at Sande Wildlife Control we provide one of the top Raccoon removal services in the GTA. Our Raccoon removal services provide assistance to customers in the Greater Toronto Area, Peel, York and Durham regions. Humane Raccoon removal services usually are not needed if you see Raccoons as adorable and great fun to watch. Contrary to this, getting rid of them is quite a task to accomplish when it comes to humane Raccoon removal. Raccoons are up at night and that is their active mode time. They can be immovable when it comes to their wanting of something. Raccoons would generally visit back porches and garages where trash cans, dog food etc. are kept. If the raccoons find their way inside the house, then let me warn you that might cause a lot damage to the property. They can also become quite enigmatic when they literally raid your garden and people who have sweet corn reaching the milk stage while ripening often risk appealing them. Nevertheless, many problems caused by raccoons can be cured with sheer common sense though. Arrangements so as the raccoon cannot crawl into spaces under houses, attics, outdoor buildings and garages by prohibiting the unnecessary guests with boards or hardware cloths. Make sure that pet food is not kept outside. You may feed your pet in the morning but avoid leaving the pet food outside as that may attract the raccoon. You must also ensure that you trash the cans properly so that they are not in the reach of any animal. Keep the attic clean so that no food smell attracts any animal. 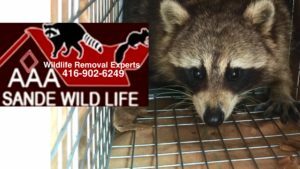 A raccoon removal service is the most effective way of getting rid of the animal and in some cases it is absolutely necessary. In fact, there are no effective products which can be used to get rid of raccoons. This is why this service has so much importance. Even if you wish to give it a try, then you would find how time consuming and tedious this job is. The effect will be seen after a very long period of time and hence no expensive product is very useful in such a scenario. At present, there are no repellents, toxic materials or fumigants registered that are effective enough in a case where we are handling these animals. Trying on different repellents from various stores will lead to frustration when those products will not work efficiently and when we would realise our time and money wastage. As a result it will make you even more disappointed with these little critters. Raccoon over population can turn out to be a major problem in certain areas and we need to find the result at the earliest. Pay special attention if the animal looks lethargic or extremely aggressive. Raccoons have been identified as the major host of rabies in the United States. Raccoons can also expose the health of your family. You need to extra careful with kids as they touch animals without thinking much and this may cause a problem for them. If the animal bites them, they might suffer from rabies. A specialist or a professional is needed to handle a raccoon in the most effective manner. Hence people should hire a humane raccoon removal to take care of their problems instead of trying to do it by themselves.